Northants County pro Paul Broadhurst lifted his second major crown on the Seniors Tour with victory in the Senior PGA Championship at Harbor Shores in Michigan, USA. The 52-year-old, who won the 2016 British Seniors Open, produced a devastating charge over the weekend as he added scores of 64 and 63 to his opening two rounds of 72 and 66 to finish four clear. Broadhurst said: “It was really a special week. It got a little bit tense out there. I knew I was playing well but I didn’t seem to be making progress against (runner-up) Tim Petrovic. He was side-by-side on the back nine it seemed. Michael Campbell showed his class over 36 holes at Wellingborough GC as he clinched the NGL Open with a five-under-par total. After shooting an opening 71 to sit two off the pace, Kettering GC member Campbell came into his own over the closing stretch of holes as he birdied the 12th, 13th, 16th and 17th holes to finish three ahead of Simon Lilly (Staverton Park). Reigning County Men’s champion Charlie Salter (Northants County) took the amateur plaudits as he beat Peterborough Milton member Tom Burgh, who led at the half way stage, on countback by 2017 with a two-over-par gross 146. Joe Witty (Northants County) won the amateur net prize. Chelsey Sharp (Kettering) carded nine net birdies in a winning score of 40 points in the NGL Roses Spring Cup as she grabbed the honours by one at Collingtree Park GC. Peterborough Milton duo Emily Horsted, who parred the closing hole, and Shivani Karthikeyan both came close to snatching the top prize before having to settle for second and third respectively on 39 apiece. The gross prize went to Ashleigh Critchley (Kettering), while Eleanor Hamilton (Northampton) won the nine-hole Roses Spring Fun Competition after posting three net eagles on her way to a total of 19 points. 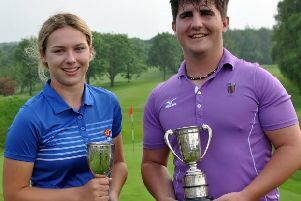 A strong field of junior golfers will be battling it out over 36 holes at Oundle GC to be crowned the respective NGL Boys and Girls County champions on Thursday, May 31. Ten different clubs will be represented as 41 golfers compete in the boys event and 18 in the girls competition, including Ellie Darnell, who will be looking to add the 2018 girls title to the ladies crown she claimed earlier this month. NORTHANTS claimed the notable scalp of eventual winners Essex on their way to finishing seventh out of nine teams in the Eastern Counties at Seacroft. Charlie Salter and Liam McNeela won twice on the opening morning as Northants beat Bedfordshire and lost to Leicestershire, before the side suffered defeats to both Suffolk and Norfolk in the afternoon. 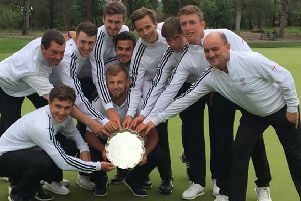 A narrow victory against Berks, Bucks & Oxon and a 4-1 loss to Cambridgeshire followed the next morning, before the county ended their campaign on a high as they lost just one of five ties against both Essex and Lincolnshire on the final afternoon. Staverton Park made it three wins in three home outings as they became the first team to defeat Wellingborough, thanks to a 5-2 success. Most of the damage was done early on as Sue O’Hagan, Denise Aitchison and Ann Cox secured home points, before Sharon Jones confirmed the win on the 18th hole in game four. Bina Shah and Gill Rivers collected Wellingborough’s wins, before Staverton, who now face three away matches, grabbed the last point. Away wins are proving to be a rare commodity in this section after the latest four matches all ended in victories for the host club. Peterborough Milton beat Oundle 4-3, before losing by the scoreline at leaders Cold Ashby two days later. Delapre suffered a whitewash defeat at Oundle, before Rushden defeated Cold Ashby 6-1. Overstone Park produced an incredible home display against Silverstone as they recorded a collection of huge wins in a 7-0 whitewash. Marlene Roy (8&7), Suzanne Silvester, Helen Roy (both 7&6), Margo Lerin (7&5), Gill Hodgson and Ellen Steel (both 6&4) all bagged points, before Julie Stapleton wrapped up the perfect day on the 18th hole. Elton Furze proved too strong for Kingsthorpe at home as points from Sue Pawson, Pauline Hurley, Barbara Stone, Trish Crighton, Jane Ross, Jackie Butler and Anna Frey secured a 7-0 win. Northampton stamped their authority on their section as they completed a second away win in a row with a superb 14-2 victory against Cold Ashby. David Goldman and Gary Slinn (two holes), David George and Dan Hayday (four holes), Craig James and Simon Hunt (five holes) and Peter Smith and Ian Tarry (three holes) grabbed the away wins. Northants County, who lost to Northampton in their opening home match earlier this month, responded brilliantly with a 14-10 victory at Overstone. Another defeat looked on the cards when the hosts led 10-1 at the half way stage, but County produced a magnificent fightback as they took the last three ties by the margin of four, one and eight holes. Kingsthorpe made it three wins in three home matches this year as they defeated Farthingstone 10-2, before recording a 20-5 victory against Priors Hall. Adam Willix, Mark Todkill, Peter Cawley, Danny Cramphorn and Jay Vierya were successful for Kingsthorpe in both matches. Farthingstone and Priors Hall then met, with the former winning 21-0. Whittlebury Park and Daventry are now the only two teams who can catch Kettering at the top of the standings after contrasting recent results. Jon Newman and Jason Robinson’s victory on the first extra hole for Whittlebury saw them beat Peterborough Milton 3-2. Daventry, who host Milton before travelling to Whittlebury in their final match, stay second behind Kettering despite suffering a 4-1 loss at Oundle. Overstone Park kept alive their hopes of reaching the semi-finals with a battling 3-2 away success against previously-unbeaten Northants County. With all five ties going the distance, Overstone grabbed the honours thanks to points from James Barker and Richard Dalton in game one, Peter Gasson and Sean Davis in the next tie and James Gardner and Pete Softley in the last match.